The first audiences I am referring to are the obvious ones – your readers. While you are immersed in writing, they are flipping channels and tuning in stations. 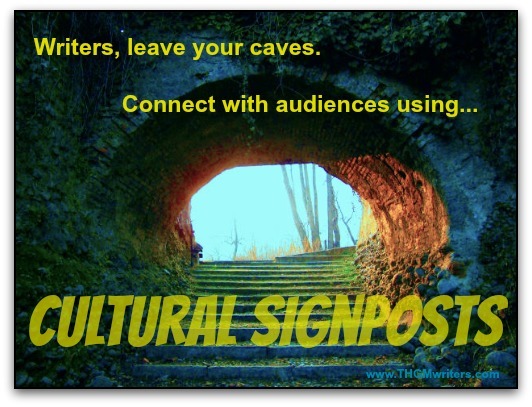 Movies, TV shows, songs, celebrities, sports teams – these are the cultural sign posts that your readers relate to. Some are timeless. Everybody knows who Shakespeare is, or at least they have a vague concept of who he is. The same goes for Abraham Lincoln. And if you are writing for an audience of tech geeks, they know who Nikola Tesla is. But many readers are much more attuned with the cultural sign posts of today. Sadly, more people know who Kanye West is than Nikola Tesla. Apparently, he sings. And he dates Kim Kardashian, who is famous for being Kim Kardashian ( #EverybodyNeedsAHobby ). Yours truly has not been oblivious to cultural sign posts, although I’ll never stoop so low as to mention Kanye West or Kim Kardashian in a blog post (oops!). But I have provided writing tips based on feature films, such as the one on Into The Woods and the one I wrote about Jupiter Ascending. And fellow blogger Kristin wrote quite recently on how Joan Rivers inspires writing. Kevin Costner? Was he Field of Dreams? That’s right – and now a musician with a band. Never saw the movie, but I somehow guessed it. I suppose most people will understand. After all, I never saw the movie, and I am not the biggest Hollywood fanboy, yet I did understand it. The second audiences I was referring to above are the ones who might not be your readers – but they are important to you anyway. A writer is also an entrepreneur and must mingle with people to promote his work. That means schmoozing at receptions. That means networking on social media. One way or another, that means leaving the hermit’s cave. Imagine if you go to a reception and all you can talk about is the weather and your work. After a couple minutes, you become famous for being boring. Believe it or not, many people are like that on social media. The only things they post on Twitter or BizSugar or Google Plus or Tsu are their own blog posts. Yes, I know – they are in a rush. But as interesting as their own writing is to them, and as important it is to promote one’s work, what message does that send? It tells people they are boring. Even if they are not. They need to post about other things that are happening – about movies and music, about breakfast and dessert, about kids and cats. Yes, cats! I reached out for the mic and in 30 seconds I made it look like I was a real professional. However, I forgot the part that made me unique: my human part. I forgot to tell people about my hobbies or my interests. And that didn’t leave room for too much discussion in the networking session. So my advice: make it personal. Does the same apply in the online world, in social media? Well, consider who is on social media – the same people as in the real world. The same humans with the same emotions and the same psychology. You are not interacting with an avatar; you are interacting with the person behind the avatar. Don’t send them a friend request first. Send them an email and let them know why you are contacting them. Stop by their profile and read more about them. What are their interests, what are their hobbies, what books do they enjoy, what groups are you both a part of, what movies are their favorites, what TV shows do they watch, what music do they listen to, are they animal lovers. Surely you can find something in common with them that you two share. Lead with that. But to find something in common with them, you need to have interests of your own. More importantly, because only one in a hundred possible relationships will share the same hobby, you need to be able to talk about the things most common amongst people – culture. If you can develop eclectic tastes in music, film, TV and sport – in other words, mainstream entertainment – you will find something fun and easy to connect with almost everybody. You won’t build up fans, partners or a network talking only about your product, whether that is writing, editing or Avon. You’ll only make people yawn. You need to know the cultural sign posts and make good use of them. Be sociable, show your human side – don’t just talk shop online. What a pleasant surprised to know that you mentioned me in your post, which I loved by the way. Who wants to connect with someone who is all about themselves? Even if they are Kenya West or Kim Kardashian… Yeah, I’ve never really figured out why she’s popular either. What does she actually do? I’m asking because I really don’t know but at the same time I really don’t care either. I’m not an expert writer but I know that people will connect with you on a more personal level when you share more about you or your experiences. If I read a post and it’s all about the writer yet they don’t make me feel like they care about me at all I more than likely won’t be hanging around for long. I would think most people feel that way as well. I certainly would hope so. Thanks David for the mention, so nice of you. Hope you’re enjoying your week and take care.